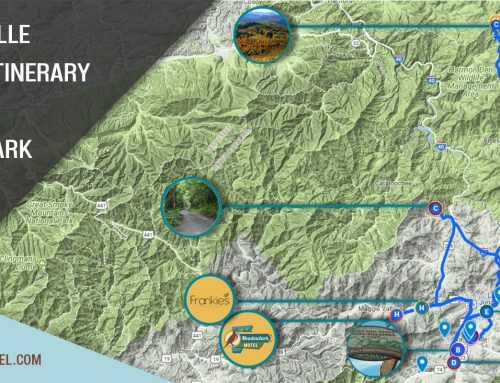 Only a 40 minute drive from the Meadowlark Motel in Maggie Valley, Asheville is a day trip of fun relishing its organic and natural appeal. Surrounded by the natural beauty of the Blue Ridge Mountains, Asheville was uniquely developed in a valley. Today, tourists can experience fine arts, live music, skiing, hiking, local craft breweries, and a diverse food/ bar scene. 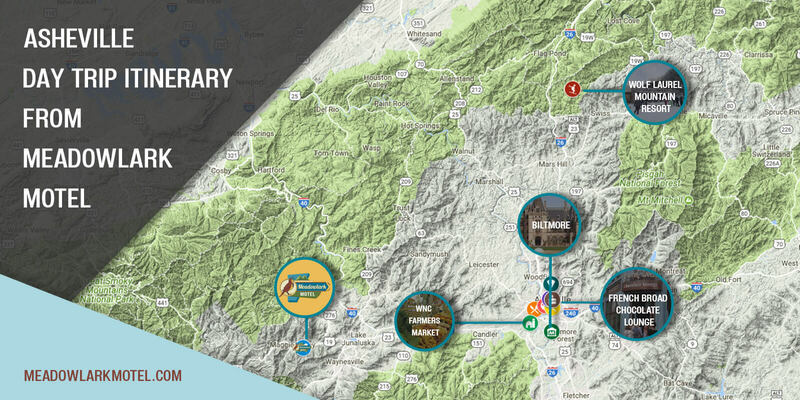 As you will see, there are many things to do in Asheville, NC. 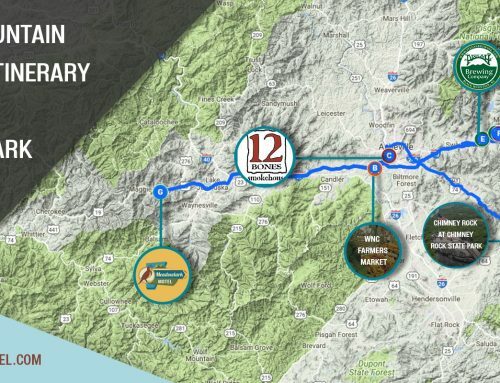 This road trip itineraries will allow visitors to experience some of the highlights that Asheville has to offer. Before your day trip to Asheville, stop by for a beverage and a morning snack. Located in the hip and unique West Asheville; the Sunny Point Café offers a delightful twist to breakfast and comfort foods. During peak growing season ingredients are locally sourced from their Sunny Point Garden adjacent to the restaurant and from local growers. Best of all throughout 2017 the restaurant is supporting a local nonprofit every month; November is the Friends of the Smokes. Asheville Brewery Tours offers a tour every day of the week starting at 49.00/ticket. Let the locals of Asheville show you the highlights of the local beer industry that the city has to offer! Call or visit their website to reserve your spot on a unique tour of Asheville. Please note that closed toed shoes are required. Want to tour on your own? 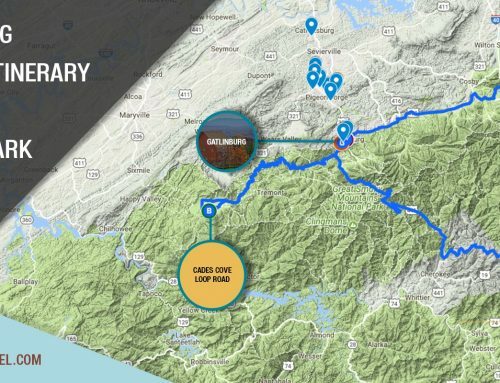 Check out: https://ashevillealetrail.com/trail-map/ for local listings of available breweries and weekly beer events. Art Connections Tours are intended to connect art enthusiasts with the makers in the most proper way: one on one at the places where they craft their work in the scenic Western North Carolina. After 25 years of helping guide artists’ careers as a gallery manager and buyer, Sherry Masters shares her many connections and invites participants inside the studios of leading and emerging artists in a range of media from clay, fiber, metals, wood, glass and more. Tours to visit artist studios are planned to suit your schedule. They range from 1.5 hour River Arts District overview to a half/full day tour of Asheville’s art scene. Centrally located in downtown Asheville at the packs monument. The Rhubarb’s owner and James Beard nominated chef John Fleer runs a kitchen that resources locally grown products within the region of Western North Carolina. The menu at the restaurant changes daily with fresh ingredients based of the highlights of the season. Completed in 1895, George Washington Vanderbilt II built a Châteauesque-style mansion like no other with breathtaking Blue Ridge Mountain views. It established itself as the largest privately owned house in the United States which still stands today. Activities on the property include various tours of the estate buildings, a large walk through of the property garden, biking, carriage rides, horseback riding, river rafting and much more. For more info visit here. Built by E.W. Grove, the Grove Arcade opened in 1929 and thrived as the country’s leading market until WWII. In 2002 the Arcade was reopened to the public while keeping with the era’s unique architecture. The renovation had a focus on shopping, services and varied dining options. Today it still carry’s the same theme and is thriving better than ever, this is a must see while your visit in Asheville. 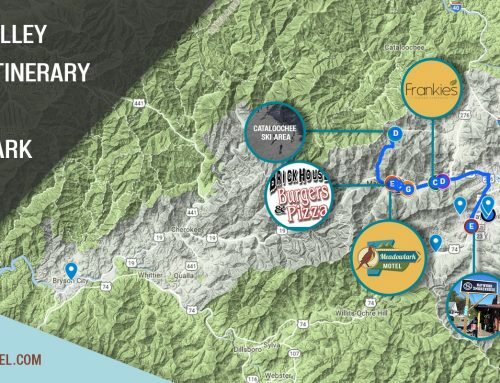 This skiing/snowboarding venue is conveniently located just 5 miles off interstate 26. It features 15 thrilling runs including 4 Green, 8 Blue and 3 Black Diamond rated slopes. The ski area offers 4 lifts for visitors to get to their preferred sections. 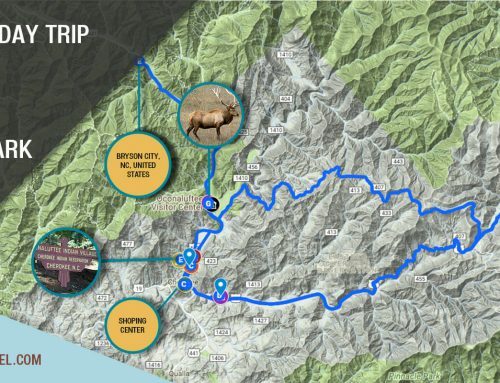 No matter your skill level, this ski mountain has plenty to offer guests and is only a short drive from Asheville, NC. Movie and Pizza at Asheville Pizza and Brewing Co.
Handcrafted locally in Asheville, French Broad Chocolates has made a name for itself! Featuring decadent chocolate dishes sourced from the finest ingredients in the heart of WNC is the French Broad Chocolate Lounge. It’s a perfect way to treat yourself for any occasion. They showcase plenty of dietary deserts to suit your needs. Don’t miss! A daytime visit to Biltmore Estate is a wonderful activity. Visitors get a chance wrap themselves in the fragrant smell of fresh evergreens while admiring holiday décor. The estate transformed into a Christmas wonderland featuring wreaths, garlands, and the sparkle of thousands of ornaments on more than 55 magnificent Christmas trees. The celebration continues across the historic estate, from colorful holiday blooms in the, to wine tasting at the winery. For more information call 800-411-3812 or visit tickets to reserve your admission for the self-guided visit of the infamous Biltmore House which includes a free wine tasting at the Winery. DECEMBER 21, 2O17-JANUARY 4, 2018 except on Dec. 25 8:00AM-8:00PM Monday-Saturday, 10:00AM-5:00PM Sunday. No admission is charged, but guests are encouraged to bring dog and/or cat food that evening to support the Santa Paws program. After your visit of the Biltmore Estate finish off your evening with a walk through of an additional architectural treasures in downtown Asheville, The Grove Arcade; which is home to shops, galleries and restaurants. Starting Nov. 22, the festive building features a Gingerbread House Display in partnership with The Omni Grove Park Inn, celebrating the 25th year of its National Gingerbread House Competition. Ruth Summers, Grove Arcade executive director says “our opening-night celebration of Winter Wonderland is designed for the entire family: music with the Symphony Chorus, the jolly old fellow, cookies and cider, ornament decorating and more. The hours for the event is 6:00PM-10:00PM recurring daily. The Winter Lights is an outdoor holiday exhibit with 500k lights each uniquely displayed throughout the Arboretum’s gardens. Visitors will have a chance to roast s’mores and enjoy a holiday inspired beverage. The Arboretum’s Savory Thyme Café will be in operation during the event with more food/beverage options. A holiday buffet will be available for guests who would like to have a special dinner [reservations are required] Cost for this event $18 Adults/$12 Ages 5-11/Free for Children 4 and under. All Tuesday tickets are $15. Arboretum members receive $2 off. The Asheville Film Society gathers every Tuesday night to watch a classic movie. The Mountain Xpress own film critic will be in attendance for introductions. Call a head for movie listings under review. Every Tuesday night Isis Music Hall hosts a bluegrass open jam night with local musicians and their respective friends. Place a call to the venue to reserve a table [menu] for this event, cost is generally free. This nightlife spot is open every Tuesday with a dance floor and like Cajun music visit website with no cover charge. Call ahead for more info! Every Tuesday night Highland Brewing Company host trivia night free of charge. Doc Brown’s Barbeque serves up dishes all evening. Call ahead for more information! The Low Keys Band performs jazz ever Tuesday night at The Imperial Life free of charge. Call ahead for more information! Reoccurring weekly on Tuesday open mic stage is available hosting top local talent. Tacos will be served with a varied selection of the local craft beer. Call ahead for more information! Every Tuesday night Hillman Beer hosts trivia night free of charge. The night will feature assorted games with teams of six. For more information on games, call ahead! Every Tuesday at Asheville Music Hall there is a jam band featuring local and regional bands with a funky twist. Get ready to get down to some awesome tunes! For additional information call ahead, most nights are free of charge! Free of charge, Highland Brewing Company hosts a night of running, drinking and having fun every Wednesday night. The Asheville Art Museum hosts a three day event for kids! Snacks and supplies are included in cost. It is $18 per day for members and $20 for non-members. Kids are encouraged to wear clothes that can get messy. It is recommended to arrive early for pre-registration, for more information please call ahead! Jack of the Wood’s weekly tradition continues into 2018 calendar year. Every Wednesday night this nightlife venue hosts players from all over Western North Carolina. This event is perfect for tourists who are looking a fun and relaxing evening. For information about the event please call ahead. This event is fantastic a social event with plenty of good eats and fun. They will be serving burgers, chicken sandwiches, fries and boozy shakes. The Burger Kings will perform classic American rock n’ roll with a distinctive twist. This all happens every Thursday evening. Reoccurring weekly, Highland Brewing Company hosts an easy-paced 12-15 mile road ride. Helmets/lights are required for the event. It is recommended to arrive early for sign-up information. Jack of the Wood’s bluegrass evenings occurs weekly every Thursday evening. The show features two hours of local musicians and an open session after 9:00PM. Riyen Roots and Friends Open Jam is known for their mix of blues, rock and roots. Guests are welcome to dance and join the jam festivities. Celebrate the Holidays by singing along with Christmas caroling. This event features live musical sing along during a tour Asheville. Cost for this event is $24 adults, children (5-11) $11. Every Friday night Wild Wing Café hosts live music, sports, good eats and beer. It is sure to be a blast! Call in advance for more information about the event. An open dance floor and live music with no cover charge. This event is budget friendly event to have fun in the heat of downtown Asheville. Every Friday night Jargon hosts free live jazz. Call ahead for more information on scheduled bands! Virginia Ground is known for their own genre of music called Appalachiaphonic. Experience their unique sound and stop by to enjoy an evening full of fun! If you are a fan of Heart and Marvin Gaye, Dark Water Rising is known for their reimagined sound for a unique “Rocky-Soul” genre. Tony Eltora’s music is comparable to Paul Simon fused with John Scofield playing Muddy Waters songs. The Grass is Dead Band is a bluegrass combo that plays tributes to the rock legacy of The Grateful Dead. This band has been together since 1998 and continue playing strong. It is sure to be a fun evening at Asheville Music Hall’s New Year’s Eve event! Tickets for this event are $17 adv/$20 day of the show. Three dance floors, DJ’s, balloon drops [$1k grand prize] and six uniquely themed bartending stations. Complimentary hors d’ourves and desserts will be available. It is sure to be a blast with something for everyone. The cost for tickets are $30 (21 and up), $35 (18-20). DJ MoTo and A Social Function are playing live at the venue’s two stages. This is a perfect way to celebrate the countdown! Party Hats and favors will be available. Tickets for this event is $1o at the door starting at 8:00PM. The Momentum Gallery open two exhibits with a NYE reception to start the New Year with Momentum! The show will feature original works by gallery artists and special guest printmaker Andy Farkas. This event will be a show case local and professional experienced artists. Live music will be played by Brydie and The Mutts with light refreshments made available. Family friendly, this event is free and open to the public. The exhibit runs through FEBRUARY 24, 2018. For additional information please call the number above. As our fast faced society gravitates to technology and the lives of those we admire, we tend to lose track of what is important in our own. Langhorne Slim uses that theme in his new album. This concert is an entertaining way to bring in the New Year. The cost is $25 adv/$30 day of the show. This premier spot in Asheville is a fantastic and romantic way to celebrate the New Year Eve festivities. Tickets are $75 per person, which will include two drinks of your choice, small plate and midnight champagne. Chef Philip Bollhoefer will be creating a special menu for the event the event is capped, it is recommended to call ahead and make a reservation. The cost for this concert is $20 adv/$25 day of the event. Recurring every Monday evening, The Ghost Pipe Trio performs cool/hot jazz at this hip cocktail lounge. The Ghost Pipe Trio performs cool/hot jazz ever Monday night at The Imperial Life free of charge. Call ahead for more information!